Last Friday I set aside a five hour block of time to find a quiet spot in the house and do nothing but write. I have dozens of blog topics bouncing around in my brain and I am currently working on my first book. Five hours of writing time falls into the category of “do what you love and never work a day in your life” and I could not wait to get my thoughts onto the screen. I had just returned home from getting my cardio for the day in form of a bike ride and was getting ready to shower, have lunch and settle down with my laptop. As I prepared to hop in the shower I pulled up Facebook on my phone and scrolled through my newsfeed quickly, stopping when I came to an urgent request for the transport of two dogs who were flying into a small regional airport and due to arrive in an hour. 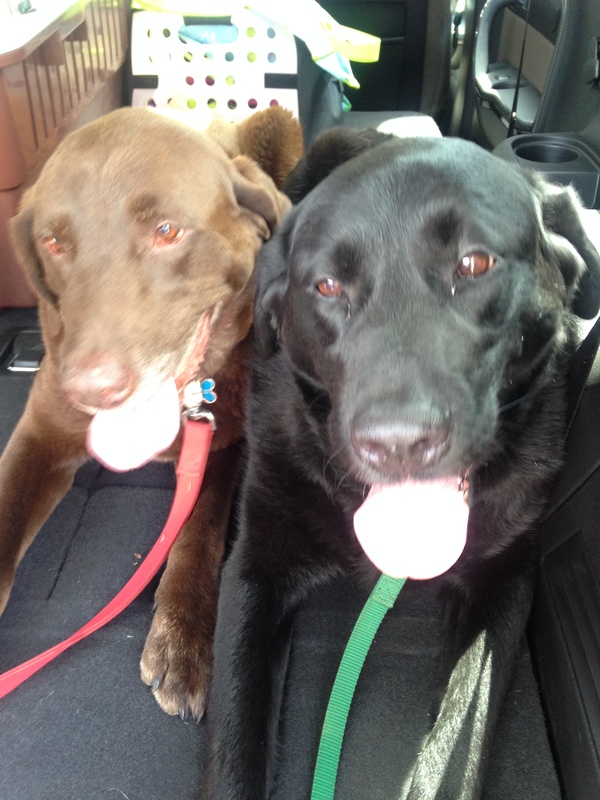 Their owner had passed away from cancer and someone had arranged for them to be adopted through Chicagoland Lab Rescue. The situation immediately became personal as I remembered how my own mother had worried about her beloved Dutch when she was dying from Stage 4 breast cancer and how I had reassured her that Dutch would have a home with me for the rest of my life even if it meant I had to live out of my car. Fortunately I was able to keep Dutch and have a roof over our heads. The two Labradors coming in via airplane today did not have that same fortune to be able to go live with another human in their family and my heart immediately went out to them and to their late owner. It seemed in some ways more heartbreaking than the strays or the owner surrenders; these babies had a perfectly good home that was to be their forever home except that the one who had loved and cared for them had died. “Do you have anyone yet?” I posted. “Not yet” was the reply. I had been adamant that my writing time was my main goal of the day, that nothing would pull me away. Skipping it was not an option. As a step-momtrepreneur I could not count the number of times I had pushed aside a day of writing to drop off a forgotten clarinet or gym uniform to school or take one of the girls to a concert or play. I loved the step-mom part of my life but it was not always conducive to finishing a book or keeping my thoughts organized long enough to publish a blog. “I can do it” I typed. My twelve year old step-daughter and I were the only ones at home and I decided that not only would she enjoy coming with me, that she could also be a huge help as I wrangled not one but two strange dogs. When I picked up Destiny from O’Hare airport in January I had my husband and stepson with me, and she was only one small dog. “What are you doing right now?” I called down the hallway as I changed from my sweaty bike tank top into an old t-shirt that I didn’t mind getting dirty with dog hair and slobber. “Getting ready to go outside,” she replied. 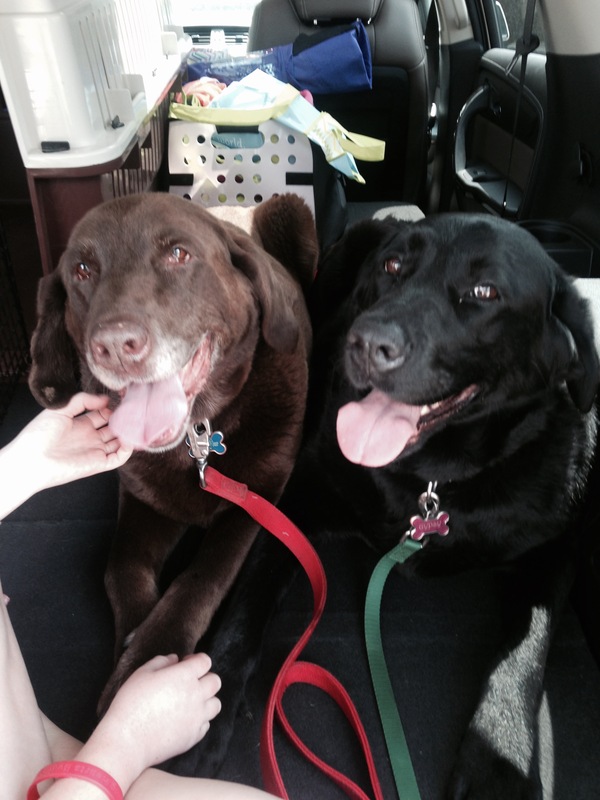 “Want to come with me to pick up 2 labs for the rescue at an airport?” I asked. “YES! !” was the excited answer. Within minutes we were in the car and headed to the Lewis University Airport in suburban Romeoville, Illinois. I had not been down that way for over a decade but I remembered it being a very small airport, nothing remotely like the situation at O’Hare where Destiny had to be collected from a special area in the baggage claim and then led across the multiple lanes of taxis, limos and busses at the arrivals area to our minivan. Forty minutes later we pulled into the airport. As we pulled into the parking lot there were several people gathered around the back of a SUV that had it’s door open. Even if there had been other people in the small parking lot it was likely that the dogs were also in the back of that SUV. As we pulled in next to the vehicle we could see the dogs hanging out in the back, big beautiful Labradors with tongues lolling out of their mouths. We greeted the group of humans and immediately went to meet the dogs. 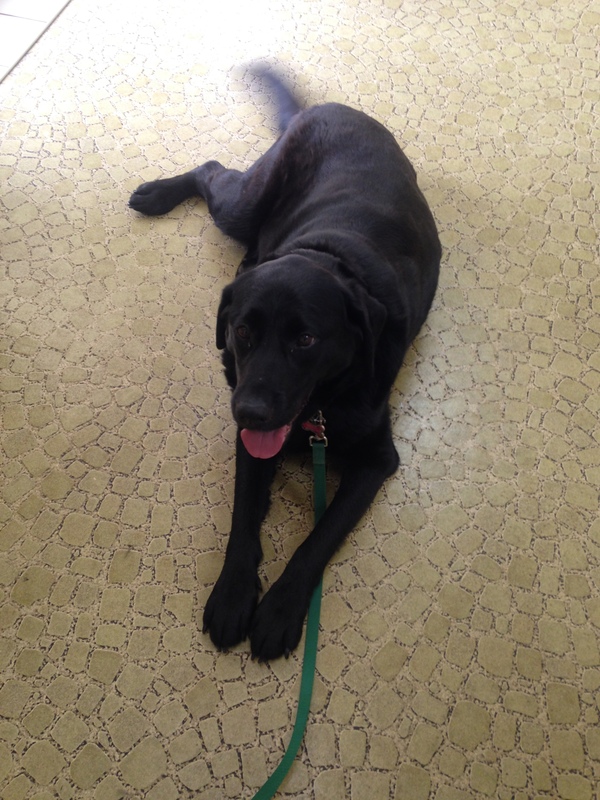 Gypsy, a large black female Labrador, was practically the spitting image of my Jackson. Her “brother” Coco, a large and equally beautiful chocolate Labrador, was nestled against her with his paws intertwined in hers and his big blocky head resting on her back, a truly bonded pair. They were panting heavily from both the warm summer day and the stress of their travels and the uncertain path their life had taken, but both had the typical friendly Labrador demeanor and we instantly fell in love with them. After a little bit of coaxing we got them out of the SUV and onto the pavement, where we were gifted with Labrador affection and took photos for the Chicagoland Lab Rescue Facebook page before loading them into the back of my own SUV. As soon as they were in my vehicle they immediately resumed their snuggling position, Coco wrapped around Gypsy with his head resting sweetly on her back. 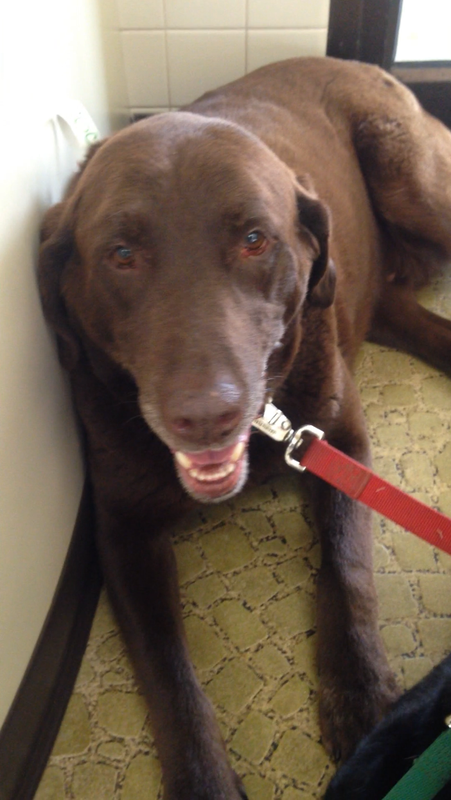 With the air conditioner as cold as it would go we headed out to the next stop in their journey: the veterinarian. During the drive I thought about their situation and how terrifying it must be to be a rescue dog, to not be able to understand why they no longer were in their own home with a familiar owner. To fly in an airplane and then get passed around from human to human, in and out of kennels and crates, to a strange vet, with nobody to explain it all. What does that feel like to them? How terrifying must that be to an animal that thrives on routine and familiarity? Twenty minutes later we arrived at the vet. My step-daughter and I went around to the back and readied ourselves to grab them if they tried to bolt as the lift gate was going up. As soon as I could snake my arm under the gate I grabbed their leashes to make sure that we would not lose a dog. “Hi sweet babies,” I cooed to them, “You guys are so sweet, you’re such good dogs.” Their extra-thick otter tails thumped heavily on the floor of the SUV and Gypsy reached her paw out to me, the same gesture that Tinkerbell does with her paw when she wants to be petted. We sat and petted them for a few minutes, knowing that they were scared and had no idea what was going on in their world, and just wanting to do something normal for them like an ear rub or stroking their backs. “Ok guys, let’s go,” I said when we were done petting them, standing up and calling them to me. They panted and looked past me. “Come. Here. Down.” I tried all of the commands they might know. Nobody budged. Since they were laying with their paws toward me and their tails facing into the back of my SUV I could not pick them up like I hoped I could do. They were too far into the vehicle and too large. We tickled under their tummies, gently nudged their rears. We nudged their rears a bit more, tried the side doors, lured them with treats. I used a stern voice, I used a sweet voice. We clapped and jumped up and down. Nothing worked. Finally Coco backed up enough that I could pick him up from the side door and wrangle him onto the ground. With him weighing in at over 100 pounds it was not pretty but it worked and he had all four paws on the ground. Breathing a sigh of relief I grabbed his leash and we headed to the back to try to coax Gypsy out of the back. Before I knew what had happened, Coco leaped back up into the back of the SUV and nestled next to Gypsy in the same spot where he had been. “No!!!! !” I exclaimed as he laid his head back onto her and nestled so close that there was not a millimeter between them. My heart broke as I thought about his fear of being more than an inch away from Gypsy. I just wanted to be able to tell them that it would all be ok, that we would keep them safe and find them a new home where they wouldn’t be scared and they could always be together, but that they had to get out of my car and go see the veterinarian before anything else could happen. A few minutes later one of the clinic staff came to help. With her to hold onto the leash I was able to get my hands under Coco’s belly and pick him up in my arms and scoot both of us to the back. It was not the most elegant maneuver but I was able to finally pick him up all the way and set him on the ground. He immediately turned to run back to the SUV but this time I was expecting it and walked him far enough away that he could not outwit me again. With Coco out of the car we were able to lure Gypsy up and from a laying position. We walked Coco across the driveway and up to the walkway and my heart broke at the nervous look on his face. I have never seen such worry on a dog’s face. I told my daughter to hold onto his leash with every bit of her strength, as she is petite for her age. With Coco safe and almost inside the clinic I ran over and hoisted Gypsy out. She was heavier than Coco and although once gain it was awkward and clumsy, I had her on solid ground and out of the car. Once in the clinic we finished the paperwork and said our goodbyes to the dogs, both of us wishing that we could take them home with us, even though we both knew that there was no way we could foster or adopt them. Fostering a senior bonded pair with my young and crazy bonded pair was not an option; Tinkerbell alone would drive them both nuts with her energy. At least we could drive home knowing that they were safe and in the hands of Chicagoland Lab Rescue. It is a honor to be able to help them, to interact with them, and to share some love with them for however long we can. Those of us who volunteer for rescue are all the more fortunate for being a part of these beautiful dogs’ journeys to the happy ending that every dog deserves. Adopt, Donate or Volunteer through Chicagoland Lab Rescue at http://www.chicagolandlabrescue.org. Can’t foster or adopt? There are other ways to volunteer like transporting, helping at events or even just sharing Facebook posts about available dogs!